Simple videos have an important role to play in education. In a very short clip, we can transport viewers to a variety of locations, draw their attention to the big picture or focus in on specific details. We can simplify explanations by slowing things down or compress time by jumping forward to different moments. They can be posted online and easily downloaded. They can be viewed at any time on a variety of devices and shared around the world. And using a handful of new technologies, this can be done easily with just a laptop computer and a digital camera. You are to design and create a short educational video that will run 3-5 minutes in length. You must tailor your video for a specific audience. You can use any software you like and your footage can be original or in the public domain. You will use the design cycle to guide your process and you will document the stages on your personal wiki. Your video will be added to an HKA media library and will be available for free download. It will be finished to a high quality. During the Investigate phase, we will explore the wide variety of short, educational videos that are available online, looking at tools and techniques that were used to create them as well as the content . Below is an example of a concept map showing various genres of short videos that we looked at during one of our lessons. We used Bubbl.us to construct this one. It allows for multiple users to collaborate on a single concept map--unfortunately not at the same time. This clip (below) comes from a 1972 episode of Sesame Street. Where would you locate this on your 'content' concept map? Where would you put it on the 'form' concept map? I found this 'Harmonica Beatboxing' clip on YouTube. Where would you locate this on your 'form' concept map. Where would you put in on your 'content' concept map? During the Investigate phase, you will be introduced to a number of movie-making tools during class time. In each case, you will have some time to play around with the tool and explore some of its features, then you will create a very simple project to get a sense of what it is like to work with it. You will upload these projects to your webpage and write a brief review (2-3 paragraphs) of the software and your experience working with it. FrameByFrame is an open-source tool for making stop-motion films. It is very easy to use and you will be surprised a t how quickly you can put together something that looks really good. Pencil as an open-source tool for making traditional 2D animation. It is also very easy to get started with but there are many powerful tools there under the hood. Don't be fooled by the fact that it's free. This is professional quality software. Keynote is not something that most people would consider as a movie-making tool. But recent releases by Apple have included some powerful animation tools. This is not your boring, old PowerPoint. Flash may not run on your iPad, but it remains the industry standard for creating online content. It can be used to make almost anything from short, animations, to interactive content to video games. There is a lot to learn. As a class, we will barely have a chance to scratch the surface. Scratch is more than a multimedia creation tool. It is a visual programming language that allows to make a million different things. Like Flash, we will only have a chance to look at it briefly, but you may choose to dig deeper and use it for your own project. Celtx is an open-source pre-production tool that helps amateur and professional film-makers through every step of the process from storyboards to scriptwriting to production schedules. iMovie, GarageBand, Photoshop, Photobooth, Audacity and more are installed on your computer and you may have some experience working with these already. We will review each of these, perhaps exploring some features you did not know were there as we continue our odyssey through movie-making tools. Remember, in class, you will only get a brief look at each of these programs. Once you decide what sort of movie you are going to make, it will be up to you to learn the tools in-depth. You will need to locate teaching resources to get you through. This may include joining an on-line forum, hunting around for video tutorials or working together with a friend. You are strongly encouraged to explore additional software and add to this list. Modern digital animation tools have made things a lot easier for the traditional animator. Software like Pencil can simulate a 'light desk' to allow the artist to trace over previous images or even copy frames and then make modifications. As you can see in the above video clip, the effect is very much the same as what we see with traditional animation that was done on paper. Above is an award-winning movie from 1952 that uses stop-motion in some very creative ways. The story is a bit disturbing but offers some deep lessons and may provide you with some inspiration for how much you can tell in just a few minutes if you tell it well. In 1952, it took some sophisticated use of tools to get the effects that you see here. Today, using a tool like Frame by Frame, we can do it in much less time. The video above that was created by the staff at a book store in Toronto and is a great example of the high quality of videos that are being produced by non-professionals. Xtranormal allows you to very quickly put together 3D movies by simply writing a script. The program does the rest! Of course, there is plenty of opportunity to customize your project afterwards by adjusting camera angles and inserting gestures, but you will be amazed at how quickly you can put something together that looks quite polished. There is a large community of users with which you can share your videos. You will have to register for an account though. Be sure to follow our Digital Citizenship guidelines for creating an account. Don't share any personal information that could be used to find you in the 'real world'. Goanimate is similar to Xtranormal but it is 2D rather than 3D and the videos look much more like cartoons and you have the ability to create your own illustrations from scratch. Very cool! DoInk is another online tool for easily creating flash animations that can be used in websites or shared with the community. Check it out and let me know what you think. Stupeflix is one that I haven't tried yet but it looks like it presents a lot of possibilities for working in different styles. Now that you have looked at the wide range of videos that are out there and you have looked at some of the tools and techniques that you can use to make your video, you need to start thinking about what sort of video you want to make. List 3 or 4 possibilities in this section. Include a brief description of what the movie will be about, what it might look like and who is your desired audience. Now that you have come up with 4 different ideas for videos that you could make, you will share them with your classmates to get some help choosing which idea is the best one to go with. 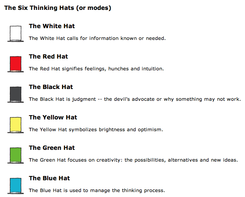 A useful tool to help us consider a problem from multiple perspectives is Edward DeBono's 6 Thinking Hats. As you present each of your 4 ideas to your group, they will wear different 'hats' (facts hat, feelings hat etc...) to offer you input to help you think about these different perspectives and make up your mind. Be sure to write down what they say and add this to each of the 'Possibilities' that you already wrote on your webpage. Your Design Specifications will list specific requirements in more detail to help us get a clearer picture in our minds about what the video will be like. It is a good idea to begin this section with a list of questions that you know will need to be answered before you can get working on the project. The answers to these questions will make up your list of Design Specifications. As a part of your research, you must consult at least one "expert" for your project. For example, if you are making a video for an audience of preschoolers, you may want to talk to a preschool teacher. To complete this section, make a list of experts that you might want to talk to and questions that you might want to ask. As a class, we will try to pool our resources and see if we can help you get in contact with the people that you need. explain the need for a product/solution for a specified client/end user. analyse a range of existing products that may solve the problem. summarize the findings from a range of sources, cited appropriately, relevant to the development of the requirements for a possible solution. • states the need for a product/solution for a specified client/end user. • states the findings from a few sources relevant to the development of the requirements for a possible solution. outlines the need for a product/solution for a specified client/end user. analyses one existing product/solution that may solve the problem. outlines the findings from a range of sources, cited incompletely, relevant to the development of the requirements for a possible solution. explains the need for a product/solution for a specified client/end user. analyses a range of existing products that may solve the problem. outlines the findings from a range of sources, cited appropriately, relevant to the development of the requirements for a possible solution. justifies the need for a product/solution for a specified client/end user. analyses a range of existing products that may solve the problem in detail. summarizes the findings from abroad range of sources, cited appropriately, relevant to the development of the requirements for a possible solution. Summarize: The summary will enable the student to concisely present all of the useful and relevant information they have found through their research. They will present this information in their own words. No credit will be given if students simply “copy and paste” text from sources. Now, it's time to get down to writing our story. The first step is to put together a storyboard. You will begin with a simple list of scenes in your video and will begin adding on from there. As you develop your script, your storyboard is likely to change as you add parts and remove parts. This is the beauty of using a digital tool such as Celtx to help you keep track of everything. By the end of this phase, you will have a complete script and a storyboard that shows each and every camera shot that you intend to use. The storyboard may use drawings or photographs. It may be that you begin with hand-drawn sketches and slowly replace them with photos as you move along. The process should be fluid. In this section, you want to consider how your video is going to look. If you have a choice of locations, take a picture of some of the options available and list the pluses and minuses of each. If you are limited to one location, you still have choices available such as camera angle and what to include in the shot. Again, take a few pictures from which you can select. Consider the pros and cons of each. Get feedback from experts or from members of your target audience. The same thing goes for props and costumes. • Which basketball court? Indoor or outdoor? • What camera angles will best capture the shot? • Which ball will you use? • What will your actor be wearing? In each case, give yourself some options. It is better to have choices. By the end of the Designing phase, you will have made all of these decisions and you will not have to waste any time when you are filming. What we hear in a movie is often just as important as what we see. And there are a multitude of technical problems involved in getting good sound in a movie. It is tricky to filter out ambient sound that you pick up if you are not filming in a quiet place. The microphones on digital cameras that many of you will be using are notoriously poor for recording sound. And it can be tricky to go back and re-record people talking so you want to get it right the first time. These things need to be planned carefully. Furthermore, many of you will consider using sound effects and music to enhance your video. (Be sure to only use work that you have made yourself or is available in the public domain.) As you have already done with your locations, costumes and props, you want to give yourself options regarding what the audience hears in your video. On your website, be sure to include some of the options you are considering and to help you make your decision, list the pros and cons of each. Be sure to test the equipment that you plan to use well in advance. Make sure that you know how to use it and that it works properly before you arrive on location and have your actors in place. There is nothing more frustrating than having everyone waiting around while you need to find batteries or remember how to adjust the light settings. • Create a design specification which clearly states the success criteria for the design of a solution. • Present a range of feasible design ideas using a range of appropriate mediums and annotation so that they can be interpreted by others. • Present and justify the final chosen design with detailed reference to the design specification. • Create detailed planning drawings and requirements for the creation of the chosen solution. • lists some basic design specifications for the design of a product/ solution. • presents one design that can be interpreted by others. • creates incomplete working drawings. • lists some design specifications which relate to the success criteria for the design of a product/ solution. • presents a few feasible designs using an appropriate medium or annotation that can be interpreted by others. • makes some attempt to justify the design against the design specifications. • creates planning drawings or lists requirements for the creation of the chosen solution. • creates design specifications which state the success criteria for the design of a product/ solution. • presents a range of feasible design ideas using an appropriate medium(s) and annotation that can be interpreted by others. • presents and justifies the final chosen design with reference to the design specification. • creates planning drawings and lists requirements for the creation of the chosen solution. • creates detailed design specifications which clearly state the success criteria for the design of a product/ solution. • presents a range of feasible design ideas using an appropriate medium(s) and detailed annotation that can be correctly interpreted by others. • presents and justifies, fully and critically, the final chosen design with detailed reference to the design specification. • creates detailed planning drawings and outlines requirements for the creation of the chosen solution. Feasible: The product/solution must be able to be created by the student with the tools and facilities available to them. Your 'Create' phase is likely to have two main parts--filming and editing. A good suggestion is to film enough extra footage so that if you have any trouble with the clips you have, you have the option of splicing in other camera shots. It is likely that your editing will take much longer than your filming. • Construct a logical plan for manufacture, which describes the efficient use of time and resources, resulting in peers being able to follow the plan to create the product/ solution. • Demonstrate excellent technical skills when making the product/ solution. • Follow the plan for manufacture to make the product/ solution which functions as intended and is presented appropriately. • Fully justify changes made to the final chosen design and plan for making when making the product/ solution. • through photographs of the product/solution from different angles showing details. • demonstrates minimal technical skills when making the product/solution. • makes the product/solution which functions poorly and is presented in an incomplete form. • constructs a plan for manufacture that contains some details, resulting in peers having difficulty following the plan. • demonstrates adequate technical skills when making the product/solution. • makes the product/solution which partially functions and is adequately presented. • outlines changes made to the final design and plan for manufacture when making the product/solution. • constructs a logical plan for manufacture, which considers time and resources, resulting in peers being able to follow the plan. • demonstrates proficient technical skills when making the product/solution. • makes the product/solution which functions as intended and is presented appropriately. • describes changes made to the final design and plan for manufacture when making the product/solution. constructs a detailed and logical plan for manufacture, which describes the efficient use of time and resources, resulting in peers being able to follow the plan to create the product/ solution. demonstrates excellent technical skills when making the product/solution. follows the plan for manufacture to make the product/solution which functions as intended and is presented appropriately. fully justifies changes made to the final design and the plan for manufacture when making the product/solution. Changes to your product / solution: In a case where changes have been made to the product/solution students must describe and justify the change. If there are no changes to the plan, there is no need to describe or justify any changes. This does not advocate a process journal. a) The complexity of skill demonstrated. b) The level of guidance needed from the teacher to complete the task. The teacher should determine the level of technical skills that the student demonstrates using a "best fit" approach. 1) Reflect on the quality of your movie. How well does it fulfill what you wrote in your Design Brief? (You MUST make specific reference to your Design Brief in this section.) Summarize and analyse the feedback that you got from your target audience. 2) Based on the feedback that you received and your experience making the movie, what will you change in your next version to improve it? Be very specific here. For example, "I will explain the steps more clearly," is not enough. You must explain exactly what you wi and why. JUSTIFY the changes that you plan to make according to experience, research and feedback. 3) Reflect on your performance throughout the phases of the Design Cycle. What did you do well? Why did those things go well for you? How can you use this success to help you in the future? What did you do poorly? Why do you think those things did not go so well? What can you do to improve in the future? Again, be specific. For example, "I will manage my time better," is not enough. A better example might be, "I will take point form notes during class and keep them on colour-coded stickies on my desktop. When I write my summaries later on, I will be able to use these notes to help me remember what I did. "4) Create a revised edit of your video. • Design detailed and relevant testing methods which are used to measure the success of the product/ solution. • Critically evaluate the success of the product/solution against the requirements based on authentic tests. • Explain how the product/solution could be improved. • Explain the impact of the product on society and the environment. • Outline how the product could be developed for the commercial market. • designs a testing method which is used to measure the success of the product/ solution. • states the success of the product/ solution. • designs a relevant testing method which is used to measure the success of the product/solution. • outlines the success of the product/ solution against the requirements based on relevant product testing. • states how the product/ solution could be improved. • states the impact of the product on society and/or the environment. • designs relevant testing methods which are used to measure the success of the product/ solution. • outlines how the product/ solution could be improved. • outlines the impact of the product on society and/or the environment. • designs detailed and relevant testing methods which are used to measure the success of the product/ solution. • critically evaluates the success of the product/ solution against the requirements based on authentic product testing. • explains how the product/ solution could be improved. • outlines how the product could be developed for the commercial market, where appropriate. Product testing: A stage in the design process where versions of products (for example, prototypes) are tested against the design need, applied to the context and presented to the end-user or target audience. Testing includes physical and user testing (user trials, field tests, expert and user appraisal, user observation). The tests may include the collection and analysis of data. Authentic tests: These tests are relevant to the project and are completed by appropriate testers to gain high quality quantitative and qualitative feedback. For example, user trials and user observations are conducted with the exact target market group stated in the design specification.